Kevin Pietersen has been told he will not be recalled by England despite scoring a career-best 326 not out for Surrey. The 34-year-old, sacked by England in February 2014, hit his maiden triple century against Leicestershire. Pietersen met Andrew Strauss, England's new director of cricket, on Monday and was told he would not play for his country again. He said earlier he was "desperate" to return to the international game. BBC cricket correspondent Jonathan Agnew broke the story on Monday evening and said that "form and ability" were not the issue and that the England set-up felt selecting Pietersen would be "a backward step". He added: "While no cricketer is actually barred from playing for England, it seems that Pietersen was told that his situation hadn't changed and his selection for England remains the longest of long shots. "Coming on the day that he followed Colin Graves' words to the letter and scored 326 not out, one can only imagine Pietersen's disappointment - and that of his supporters. "Whatever Strauss reveals on Tuesday, there can be no further ambiguity." "It's too late, there's too much baggage. Pietersen was lucky to get another chance after the text messages to South African players behind Andrew Strauss's back. "It's like being unfaithful to your wife - you might get away with it once but not twice. His book was his own infidelity, times 50. That compounded what he had already done. "And look at the facts - in the last 10 Tests he played he averaged 34. His current Test average of 47 is the lowest it has been since 2006 so it's gradually been in decline. "He's had injuries and I do think he was disengaged in the last Ashes too. He once had the 'X Factor', now he's got the 'I Factor'." Earlier, and speaking before the meeting with Strauss, South African-born batsman Pietersen had said: "What more can I do? All I can do is score runs. I'm incredibly proud of how I played under pressure. "People were saying on social media that this would be a career-defining innings for me and they were asking me if I was ready for it. I knew there was a lot of pressure on me and I was feeling it." Strauss, a former England captain, will hold his first news conference in his new role at 12:00 BST on Tuesday. On Saturday, he succeeded Paul Downton, who was instrumental in Pietersen's sacking. In July 2014, Strauss apologised for making an offensive remark about his former team-mate during a live television broadcast. Pietersen last played for England in the final Test of a 5-0 Ashes series defeat in Australia in January 2014. He was sacked a month later and released an autobiography in October criticising several players, saying there was a "bullying culture" in the squad. But after the 2015 World Cup - where England lost four of their six matches - incoming England and Wales Cricket Board chairman Colin Graves said Pietersen could be recalled if he impressed in the county game. 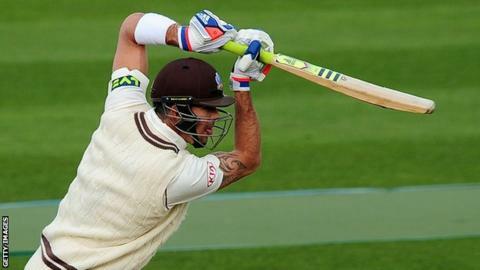 Pietersen reduced his Indian Premier League commitments for 2015 and re-signed for Surrey. Monday's innings, which came off 373 balls and included 34 fours and 14 sixes, took Surrey to 528-9 after two days, in reply to Leicestershire's 292 all out. "It is probably the best innings I've ever played," said Pietersen. "I have a burning desire to play for England again - I'm desperate to do so. "I've said for a while that I'm batting better than ever and this is proof of that. "It was an incredibly special moment, a special feeling. I've always wondered if I would get anywhere near 300, but if I bat well on Tuesday, maybe I could get near 400."